Express Entry – The secret to finding your correct NOC! If you ignore these tips now, you'll hate yourself later! [UPDATED June 25, 2017] When applying through the Express Entry system, it is absolutely essential that you get your NOC right. By following these few short tips, you can significantly increase your chances of ensuring your position is properly identified and you actually get the points you deserve for your skilled work experience. What’s so important about the NOC? Immigration, Refugees and Citizenship Canada (IRCC) uses the 2011 National Occupational Classification system to classify jobs in Canada. One of the most important ways of classification is Skill Level. If your foreign work experience in not considered to be “Skilled” (Skill Level B or higher) for the purposes of IRCC, then you will not receive any points for work experience under the Express Entry system. Further, when it comes to language testing for candidates who have been given an Invitation to Apply (ITA) for permanent resident status through the Canadian Experience Class, the actual Skill Level will determine whether or not you must meet an English language benchmark of CLB 5 (for Skill Level B) or CLB 7 (for Skill Level A or 0). For those applying under the Federal Skilled Worker Program, the minimum CLB is 7 regardless of the Skill Level. In addition to Skill Level, the NOC system assigns a specific 4 digit code to every position recognized within the database. Getting this 4 digit code correct for your position can mean the difference between success and failure within the Express Entry system. So how do you determine your NOC? The starting point differs depending upon whether or not you are currently working in Canada under an LMIA confirmed work permit. If this is the case, you can start by checking out the NOC assigned to your LMIA. However, please use caution as the NOC assigned in your LMIA mat have been created under the old 2006 NOC classification system and you may need to convert it to the 2011 NOC for the purposes of IRCC. You can easily do this by going to the concordance tables provided by the government which are used to convert 2006 NOCs to the modernized 2011 NOC. Simply look up your 4 digit 2006 NOC listed in your LMIA and it will tell you what your NOC will be under the 2011 system. Don’t even bother asking why one government department would use the 2006 and the other the 2011 NOC. I know it’s ridiculous. 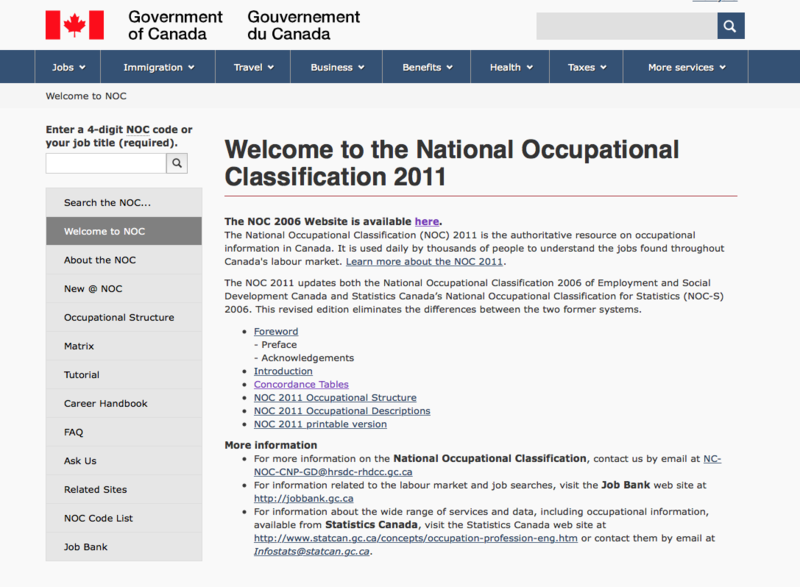 I suspect it is largely a product of budget and if Service Canada had enough budget to revamp their internal systems, they likely would have upgraded to the 2011 NOC. However, it appears they do not currently have the cash to do so. So we are stuck with having to do these conversions. However, many positions have the same 4 digit code in both the 2006 and 2011 NOCs. Provided you were not working illegally in another position or performing duties that were not originally approved under you original LMIA, you can safely use the NOC code listed (or its equivalent under the 2011 NOC) in completing your Express Entry application. If you did work illegally, you have a whole host of other problems to deal with including potential misrepresentation if you try to fudge things on your application. If you find yourself in this situation, I recommend that you contact an immigration lawyer to see if there is anything that can be done to rectify the situation. However, in most cases, there is very little we can do as IRCC does not have too much sympathy for someone who has wilfully chosen to break the law. I can’t help but hear in my mind the old song my grandfather used to play for me as a kid called “Happy Trails” by Roy Rodgers and Dale Evans. This pretty much sums up the situation for illegal workers in Canada. The starting point for foreign or Canadian work experience, that is not supported by an LMIA, is your “job title“. This is not always conclusive; however, this is where you need to start. 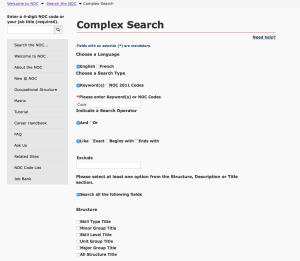 IRCC has a great little tool for helping you search for your position by title. 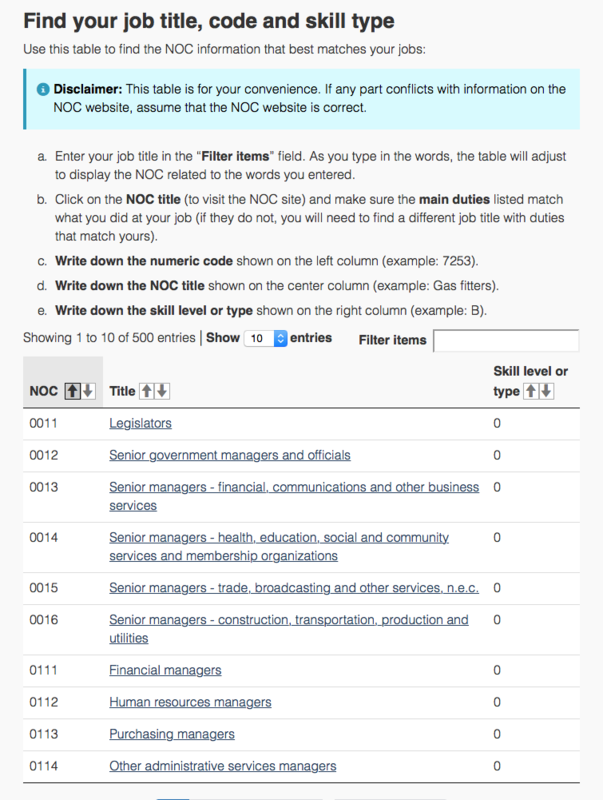 All you need to do is type the title of your job into the search field entitled: “Filter items” and the list will be sorted to most closely match what your job title would be under the 2011 NOC. See the image below. 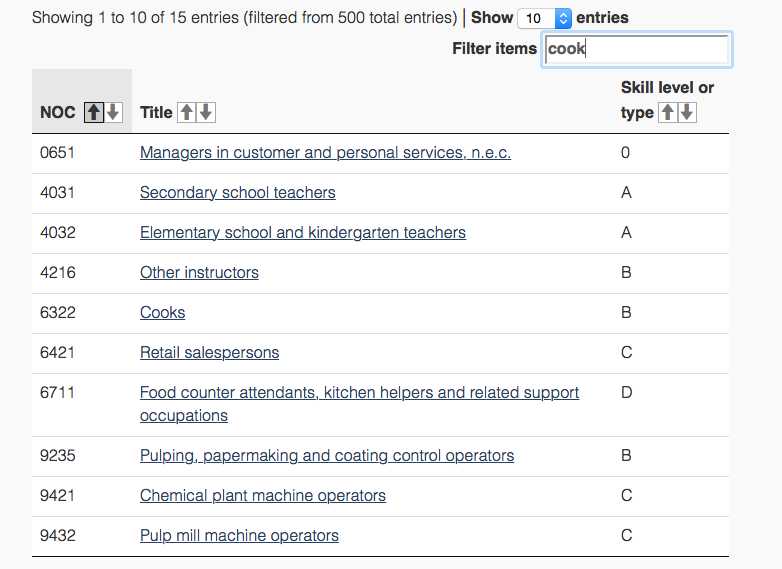 If you have work experience as a “Cook”, here are the typical search results. 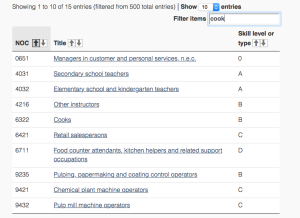 You can see from the displayed list that the 4 digit NOC for Cooks is “6322” and the corresponding Skill Level is “B”. This tells us that work experience gained as a cook, does qualify under the Express Entry system. However, if you worked as a Food Counter Attendant, this experience will not qualify because it is classified as Skill Level “D”. Now don’t think your assessment is done at this stage. This is just the starting point. 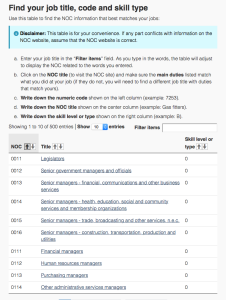 The next step is to confirm that your actual job duties (the ones you actually performed on a daily basis) match with the job duties set out in the position profile of the NOC you have been assigned. If you were able to locate your position on the IRCC list, then you can simply click on the hyperlink of that position and it will take you to the profile. Once you have opened up your position, skip to STEP 4 below for “Confirming that you selected the right NOC“. 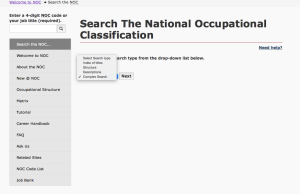 If you were not able to locate your position by searching your title, you will need to go directly to the 2011 NOC data base to manually search for your position. STEP 1 – Job Title – simply enter the title of your job in the box provided under “Enter a 4-digit NOC code or your job title (required).” This is located in the top left corner of your window. A list of potential matches will be displayed. If this doesn’t work, then go to Step 2. If it does work, then skip to Step 4 below. 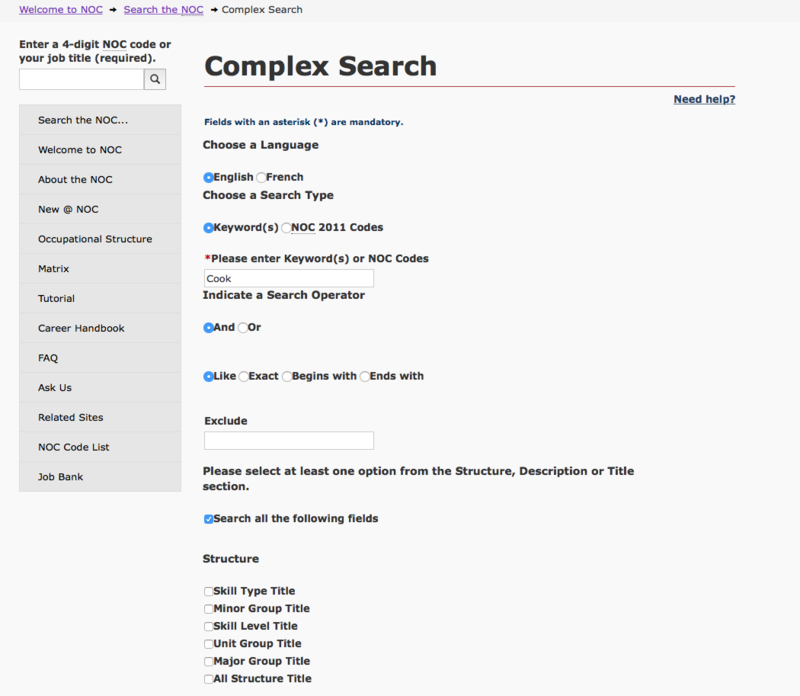 STEP 2 – Search the NOC… – After selecting this option, I recommend that you do a “complex search”. Because you have already tried to search for your title directly and came up with nothing, I recommend that you enter any number of key words that closely resemble your title or the duties that you performed. 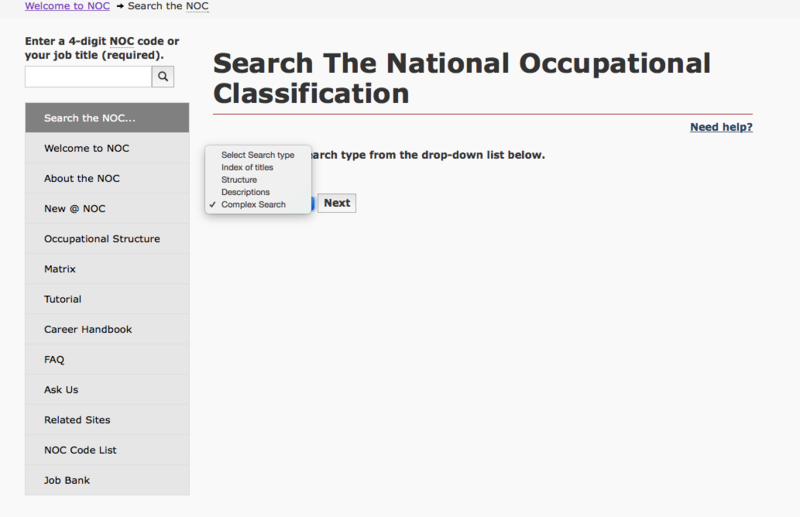 You can do this in the search field located below: “Please enter Keyword(s) or NOC Codes“. Make sure that you also check off the box entitled: “Search all of the following fields“. Then click the “Search” button at the bottom right of the page. By searching various key words associated with the duties you perform, this should create a more comprehensive list of jobs than would normally come up by searching your title alone. However, sometimes even this doesn’t seem to find the right position. If this is the case, you need to go to Step 3. In order to make this work, you have to be able to properly identify your industry from the list provided. Once you have selected your industry, the next level will be the Major Group, followed by the Subgroup associated with your job. Find the group that most closely matches your job and from there it is relatively simple to find at least two or three positions that closely resemble your job. 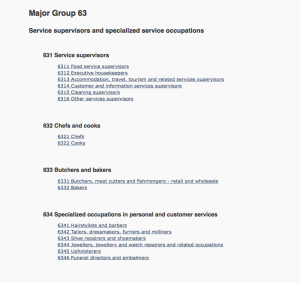 In the image above, you can see that both Chefs and Cooks are listed within Subgroup “632 Chefs and cooks“. 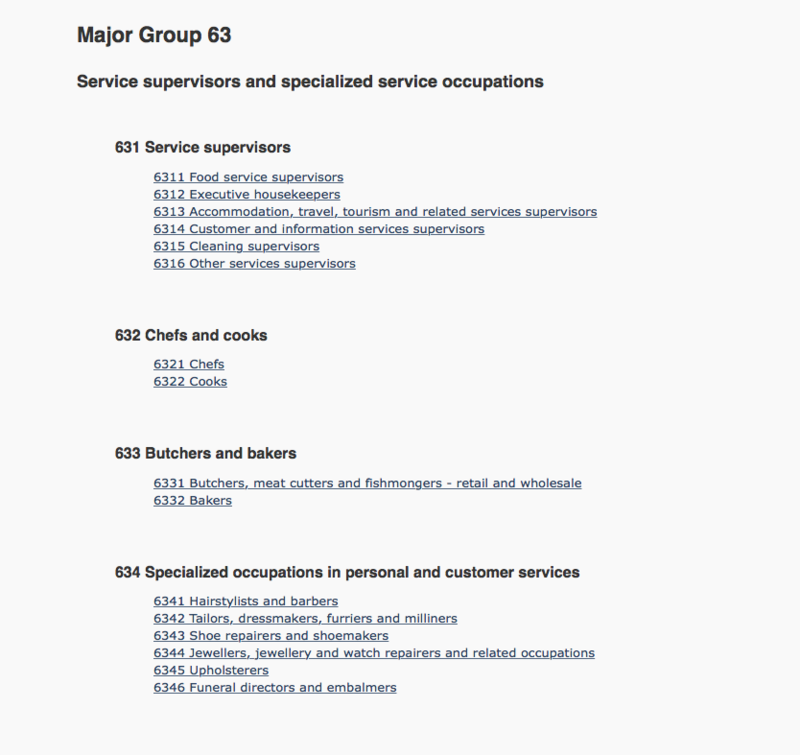 By clicking on the “6322 Cooks” link, you will be taken to the exact position profile for Cooks. This is probably the most important step of all. 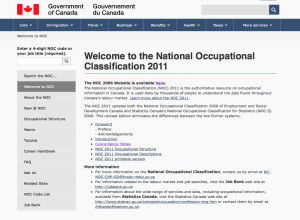 Because of the standardized methodology used by the government when creating the National Occupational Classification System, it is entirely possible to select a position within the 2011 NOC that has the exact same title as your job, but in actuality is not a proper match. Normally, I do not quote specific sections of the Immigration legislation in my blogs. However, in this case, I am going to make an exception. It is critical that you understand the legal reasons why your work experience can be rejected by an immigration officer. I have set out below, a portion of the Ministerial Instructions for the Express Entry Application Management System, which describe who a Skilled Worker is for the purposes of the Express Entry System. 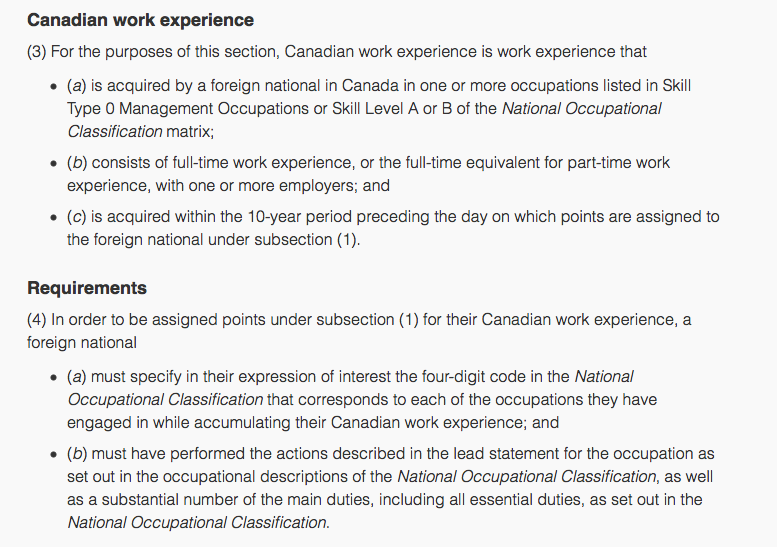 The first section relates to Canadian work experience and the second relates to foreign work experience. 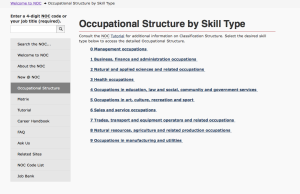 including all essential duties, as set out in the National Occupational Classification. 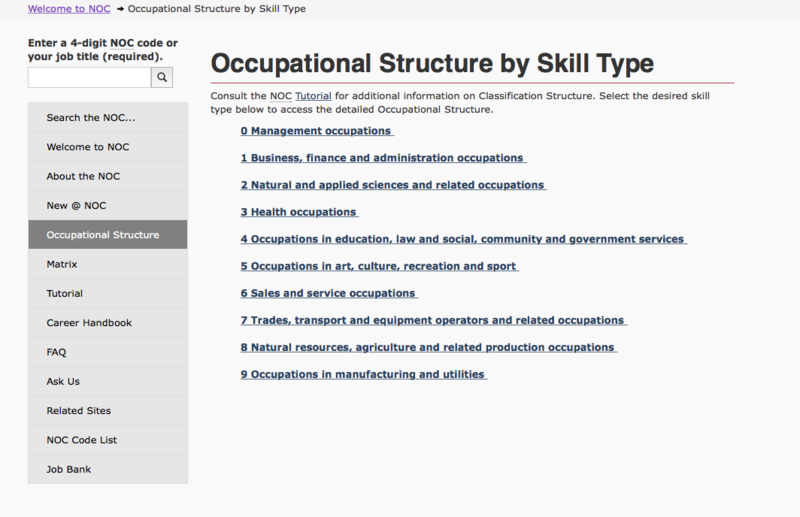 Each job profile within the NOC 2011 describes each of these factors. If you can demonstrate that your position encompasses each of these factors, then you know you have the right NOC. If however, you have not performed the activities in the lead statement or are missing a substantial number of the main duties, then you can safely assume that this NOC is not for you. There is nothing too complicated about this. The lead statement is quite general, so if you cook food for a living – pretty much anywhere – you are in….at least so far! Now let’s take a look at the main duties. Remember, you have to be able to establish that you performed a “substantial number” of the main duties. So what constitutes a “substantial number” of the main duties? Well, it has always been my position that substantial means “most”. However, there are some exceptions. In fact, this is the exact reason I chose the position of cook as an example. In fact, only 5 out of the 9 listed are mandatory. Let me explain why. If you ever see a duty, or an employment requirement that indicates “may” or “usually” within the NOC, you can assume the requirement is optional. You would still be considered a “full fledge” cook if you did not set up and oversee buffets, clean the kitchen and work area, plan menus, determine size of food portions, estimate food requirements and costs, and monitor and order supplies; or hire and train kitchen staff. However, you would still need to have performed a substantial number of the remaining 5 duties. Finally, we need to take look at what the regulations call “essential duties”. In all honesty, I don’t have a clue what they mean by “essential duties”. If you are one of those super intelligent people out there that can explain this to me, please comment below and enlighten us all. However, if you are like me and have never really seen a NOC profile description that specifically identifies “essential duties” then welcome to the club. Please note that as a starting point, you DO NOT have to meet the minimum “Employment Requirements” in order to get credit for your foreign work experience when apply through Express Entry. However, I still think it is important to understand how they do fit into the picture if you are one of those very lucky people to have a job offer from a Canadian employer that is supported by an LMIA, or another work permit option under the International Mobility Program. As stated previously, although I do not quite “get” the essential duty thing, I do understand the “Employment requirements” thing that is built into every NOC. In addition to being able to perform the actions in the lead statement and a substantial number of the main duties, in the context of a Canadian work permit, employment requirements can not be overlooked. I can’t tell you how many work permits I have seen refused because a foreign national does not have the specific education or work experience requirements listed in the NOC for their proposed position. This typically occurs after companies have spent thousands of dollars obtaining an LMIA only to see that the candidate they chose does not qualify for the position based upon IRCC’s requirements (essentially the NOC requirements). So let’s take a look at the employment requirements for a Cook. The first place to start is to determine what is “mandatory” (remember, I don’t really have a better word) and what is “optional”. This can be easily done by applying the “may = optional” and “are required = mandatory” rule. Completion of secondary school is “usually required”. This means it is not mandatory. If you didn’t graduate, you are okay so far. Completion of a three-year apprenticeship program for cooks OR completion of college or other program in cooking OR several years of commercial cooking experience “are required”. Because this ends in “are required“, then this is mandatory. However, because of the “ORs” inserted between each requirement, it means you only need to satisfy one of the above three and not all of them. So, if you never graduated from school, but have “several years” of commercial cooking experience, then you are good to go. I think it goes without saying that “voluntary” means just that. However, I do want to point out that many “trade” positions are regulated in Canada and if you ever run into a trade such as welding, pay close attention to whether or not it is a regulated AND compulsory trade in your Province of destination. Now, failing to meet the minimum employment requirements will not impact on your Express Entry application; however, in the context of work permits, it can be a deal killer. So pay attention if you anticipate applying for a work permit before your Express Entry application is completed. Once again, “available” is also one of the optional factors that really doesn’t impact on your Express Entry application. There is definitely a lot to remember when searching for your proper NOC. However, if you start with the IRCC tool for matching titles to NOC codes, your battle is often won at this stage. All that remains is following my instructions above to evaluate the duties and employment requirements in order to confirm you got the right one. If you weren’t so luck with the IRCC tool, then following the remaining steps above should help you drill down to your exact position. In order to help as many people as possible navigate the complexities of the Express Entry program, I created a complete Step by Step Video Tutorial to show you how to do it yourself. Obviously, I would love for people to book a paid consultation with me and retain me to represent them in filing their Express Entry applications (you can do so by accessing this link: http://www.stringam.ca/immigration-mark-holthe/). 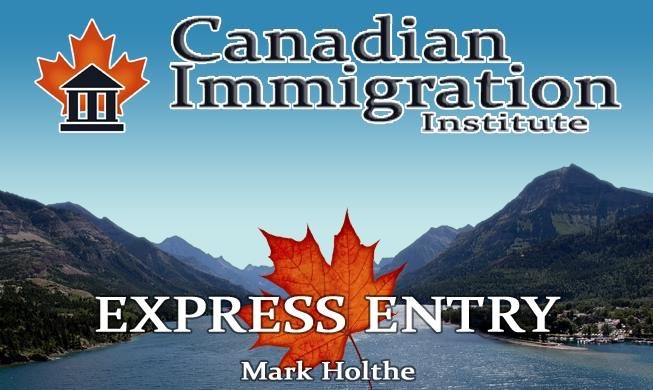 However, for many of my readers and those that follow me, I highly recommend they consider purchasing a monthly access to my Express Entry – Complete Step by Step Video Guide to Doing it Yourself . I know you will love it. Awesome step by step guide! Clearly explained. Thanks Nicole. I really appreciate your kind comment. Have a wonderful day my friend. You are very welcome. Please do not hesitate to provide any suggestions you have for making the resource even better. Hi there. I am currently living in Alberta and I worked for two years as food counter attendant in subway restaurant and right now I received new Lmia as food counter attendant again for the same company I worked for.is there any chance for me to apply for express entry now with my new Lmia. Food counter attendants are considered low skill. Without prior skilled work experience you would not be eligible. Hi i have done bachelors in petroleum engineering and i have worked in one of my friends restaurant for several years so can i get points for my bachelors degree and apply as a cook or chef?